A few months ago, I clued you all in on the fact that I was starting a new job. I think I promised I’d tell you all about it, but as so many of my blog promises go, life just got in the way and I don’t think I told you a darn thing about it. But the Cliff’s notes version is this: I get to work at 8:00 every day (or least in that general area, sometimes earlier, sometimes a smidge later- I actually have to do deal with “real” traffic now & sometimes that can be tricky). If I need to, I can walk out the door at 5:00 on the dot. I have fewer distractions, a lighter workload, and all of this makes me a little bit more sane. I miss my old co-workers like the Dickens (that’s a real phrase, right?) but I hang out/chat with/visit them often so it’s okay. Truthfully I miss my old job too. It wasn’t that I ever disliked my job. I just disliked the hours I had to put into it in order to do things the way I wanted them done. I worked there for so long that I started to feel as though I had to do everything SO. WELL. or I was a failure. I spent nights wide awake worried about what I might have messed up. I found myself never wanting to leave for fear that an error I made would become apparent the moment I walked out the door so it was just easier to be there to deal with things head on. I was always on call, constantly checking work email. And even though I knew my salary was based on 42 hours/week, and work didn’t pay the bills for that phone I was ever so fervently checking, I never. stopped. working. It was an unhealthy attitude and an unhealthy situation that I needed to get myself out of. 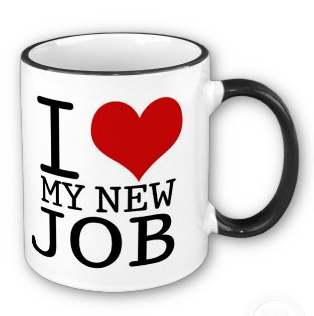 I was lucky to have a referral to a fantastic company, even luckier to actually land the job. Of course work is work and I have my bad days at my new job too, but overall I am just so darn happy I made the move when I did. That’s not to say that adjusting to a new routine, a new schedule, and new people hasn’t been tough. Transition is hard no matter the circumstances. So when I was asked to contribute to the company blog a few weeks ago, I knew just what my topic would be. Here, have a look! There might just be some useful information for you too! Adjusting to a new job is tough. Whether you’re making a career change after just a few months, or many years, transitioning into a new role can be downright scary. Changing jobs means meeting and trying to fit in with all new people, it means a new routine, perhaps a new schedule, a new commute, and obviously, a new set of tasks and expectations. I recently started at AMPED after more than ten years with my former company. I went from being a wealth of knowledge and someone who others relied on for all the answers, to being the one who knows almost nothing. My commute time more than doubled, which means my alarm clock now goes off an hour earlier. I sit at a desk the majority of the time now, when previously I had a good mix of sitting and being on my feet. These are all things that have taken some getting used to and I’m certainly no expert in the career change department, but looking back I realize that there are a few things that have really helped my transition go a bit more smoothly. The following are a few suggestions for you if a career change is in your future. Practice your routine. In the days or weeks leading up to your first day at the new job, take some time to test out your new wake up time, commute, parking, etc. Even if you’re not able to try the drive at the time of day you’ll actually be commuting, do explore all the possible routes. Feeling confident in my new commute definitely helped calm some of my first-day nerves. Nobody wants to make a bad impression by being late on the first day so if you can squelch even an iota of that nervousness by not being concerned about getting lost, you’re in good shape! Ask questions. You will undoubtedly get bombarded with information in the first days and weeks at your new gig. It will be entirely too much information to take in at once, but by engaging and asking questions, you may just retain a little more of that information than you would by listening alone. Likewise, nobody expects you to get everything right on the first try. If you’re feeling uneasy about a task you’ve been assigned, ask for help! Your co-workers are your best resources. Accept invitations. It can be intimidating asking questions of those aforementioned co-workers if you don’t feel comfortable doing so. One of the best ways to get to know the people you’ll now be spending more time with than some of your own family, is by accepting their invitations. Whether they invite you to happy hour, or for a quick coffee run, it’s important to accept the invitation. Getting to know your co-workers outside of work can help you feel more at ease when you need their help back in the office. Immerse yourself. Everyone learns differently, but in my experience, the best way to really “get it” is to fully immerse yourself. I was so scared to answer the phone for the first time, but I took comfort in the fact that the hold button was my new best friend. Any question that came in could be answered by someone in the office. And by fielding those questions and finding the appropriate person to answer them, I was learning something by listening to the response. Take the opportunity to listen in on conference calls, request that your co-workers copy you in on email responses so you can later use them as reference. Even if the information isn’t immediately relevant, it’s likely that you’ll benefit from it at a later time. Stay positive. This is probably the hardest of all. Even after four months, I get frustrated when I don’t know how to do something, don’t know how to answer a member’s question, or mess up something that should be really easy. But it’s important to remind yourself that nobody figures it all out right away. The President probably gets lost on his way to the bathroom in his first few months in the White House, right? The bottom line is that we learn from mistakes, and we all make them. Beating yourself up over it just isn’t worth it. If you can manage to stay positive, even despite all of the inevitable mistakes you’ll make, you’ll be so much better off in the long run. Originally posted on AMPED Blog.